Last time we covered how the way you drive and use your car can affect the service life of your brake components. Now we will take a look at how individual components of your brake system can fail thus shortening the life of your brakes. The most common cause of shortened brake pad life comes from sticking brakes. See when the brake pedal is depressed it acts upon the master cylinder which distributes this force in the form of compressed fluid to the brake caliper which clamps the brake pads down on the rotors. When the brake pedal is released everything works backwards and the brake pads go back to their original position. But what happens if the brake pads don’t move back when the brakes are released? 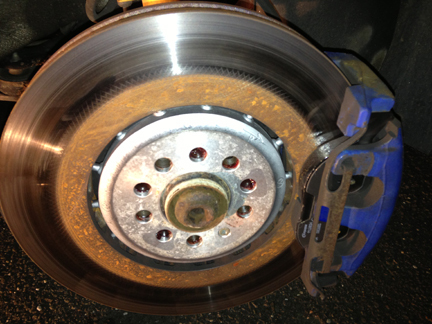 The brake pads and rotors would still be touching each other and the friction will wear them both down. This is what is known as sticking brakes. It happens quite often and most of the time you won’t notice it until your car is in for service and the technician tells you one or more of your brake pads are wearing down faster than the rest. There are a couple of ways this can happen. Partially seized brake calipers are one. The brake calipers have an internal piston that clamps on the pads when the vehicle is braking. Overtime the caliper piston can seize causing the brakes to not fully retract. Brakes could also stick if the caliper slide pins aren’t lubricated with grease. The slide pins connect the brake caliper to the caliper bracket which is how the caliper is mounted on over the rotor. The pins allow the caliper to slide when the brakes are applied which helps the pads retract when released. Worn suspension can also shorten the life of your brakes. The springs and shocks help support the vehicle weight. There are many different types of body motion when the car is rolling down the road but the one we will concentrate on here is dive. When the car comes to a stop all the weight slides forward causing the car to dive. Worn springs and shocks will put more weight and stress on the brakes causing them to work harder and wear faster. It also increases the stopping distance when you brake. Although there are other causes, these the main culprits of shortened brake pad life. So now you can understand the forces at play every time you step on the brake pedal. A good service technician will not only service your brakes, but also figure out if your brakes are wearing down faster than they should and why. So feel free to stop by MR Auto SD to have your brakes checked out. Until next time be safe out there.